Mares design is inspired by marine mammals. Channel Thrust technology maximizes the channeling of water and moves a much greater amount of water compared to other fins of the same size. The result is greater thrusting power with the same amount of effort. Latest development in Channel Thrust is the Super-channel. The blade is designed with a large flexible central Super-channel propelling water-flow more efficiently down the fin blade instead of letting it spill over the sides for optimal performance and minimal diver effort. 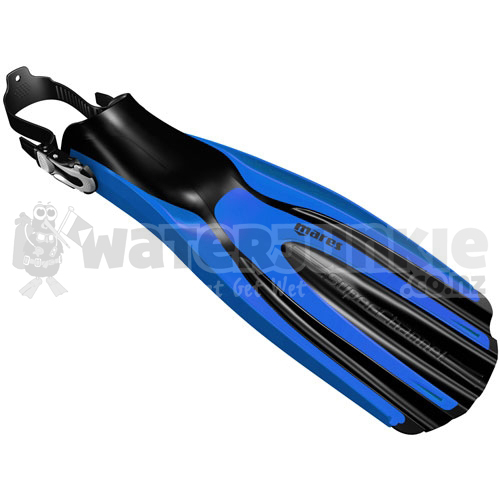 The Avanti Super-channel is designed for the diver who wants the perfect blend of power and efficiency in one fin. The new blade design with a large central Super-channel and two traditional lateral channels provide excellent thrust while maintaining hi-efficiency and minimizing leg fatigue. The blade is constructed of Tecralene and Thermoplastic rubber for extended durability. The straps feature ABS Plus (Adjustable Binding System) for one step quick and easy opening or closing. The Avanti Super-Channel uses Mares patented design ABS Plus Buckles. It only takes one quick movement to easily open or close these buckles, even when wearing thick neoprene gloves. The double button release prevents the buckles from accidentally opening making them the most user friendly system on the market. The foot pocket delivers maximum power and evenly distributes pressure over the foot to minimize fatigue. The foot pocket interior features internal ribbing that improves fit, eliminates foot suction and prevents foot pocket flexing, while transmitting more power to the blade. Fin comes in four colors and three sizes, has an overall length between 59 to 63 cm depending on size. 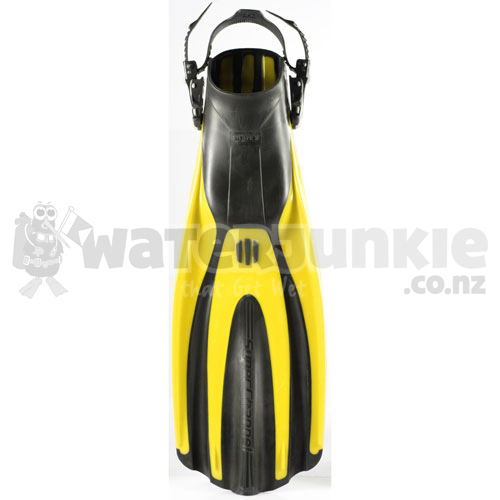 Fins are made from Tecralene and Thermoplastic Rubber; weigh between 1.62 kg to1.94 kg and come with a 24 month limited warranty.